Who says advertising to kids doesn’t work? I’m thinking of changing my little boy’s name from Mr Meat&Potatoes to TAD. Not Ted, TAD. The. Advertiser’s. Dream. He came to me the other day and stood slightly closer than usual which implies that he has SOMETHING IMPORTANT to tell me. I looked into his very serious eyes. Silence fell between us. Him looking up with wide eyes and a slight slow nod and me, perplexed, trying to place the phrasing, knowing that I’ve heard it before. Dramatic pause. Then a whispered reply as we leaned in so close that our heads were nearly touching. 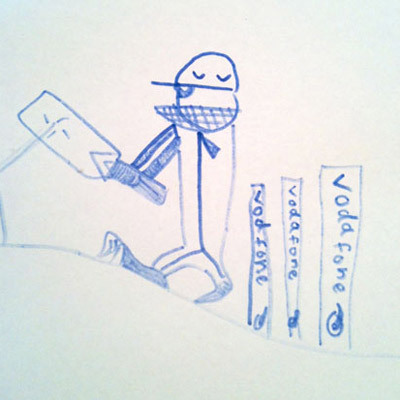 Those who follow VS on Facebook, will have seen TAD’s drawing of the cricket, complete with the Vodaphone logo. 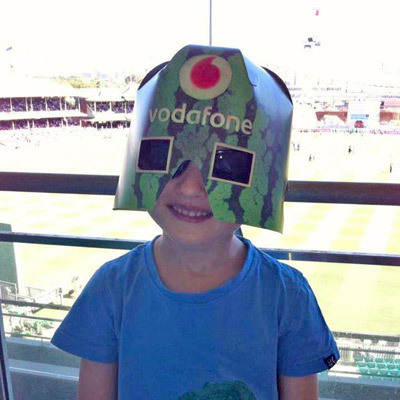 This was funny, and after posting it on Vodaphone’s wall, it won him tickets to the test match and a signed Michael Clarke shirt. Now I’m wondering if I can get him going on a large scale artwork with the full Disneyland map with a lovely QANTAS plane flying us there. And maybe a little Tiffany’s store down in the corner with a portrait of me, deliriously happy outside. Perhaps I could shop that around social media to the benefit of me my family. Seriously though, I’m quite shocked by how much he absorbs from corporate messages that I totally tune out. Perhaps it’s because he usually watches ad-free ABC channels, so when he does see a thrilling 15-second snippet he pays attention? Perhaps in my vigilant anti-commercial stance I’ve done him a disservice and set him up to be the most gullible consumer of all time? There’s good advice here from Raising Children about how to counteract it all. Do you have an ad strategy? How gullible trusting are your children? I like your plan to help foster Mr M&P/TAD artistic talents. Thanks for the link to the article, it was a great read and would be a useful talking point with the kids. yes, well, I suspect we’re all a bit guilty of that from time to time! I was just having this same thought to myself yesterday. My Miss4 was looking at the order form for those entertainment books that people sell as fundraisers. The form had a few logos of companies included in the book. She went through them all and told me what each were. “Dreamworld, Kmart, coles, movies (Event Cinema) pizza shop (Pizza Capers), petrol shop (Caltex), Wet n Wild, ice-cream shop (Baskin Robins), chippy shop (Hungry jacks) and cafe (Coffee Club)” Now I don’t believe she has seen actual advertising of these places, more that she absorbs them in everyday life. Miss4, like your boy, watches abc2 or abc3. But if she wakes up early on a weekend and wanders out and happens across Ch9 say Dora or something…then I am bound to be woken by a voice telling me how much she needs (insert toy, game, item here). She has even woken me to tell me about an amazing fridge that we had to get because it had extra doors and special shelves. My kids watch Abc (just press 22 mum gets bandied around a fair bit). Before Christmas I taped the Michael Bublé Christmas special that was played on channel 7 a few times. I can’t work out how to edit the ads so the kids watched a bit of Bublé tv in the lead up to Christmas. In fact my eldest, who is 4, was asking for it everyday & I took it me awhile to realise that some of the excitement lay in watching the ads. This was confirmed when we drove past a Bunnings store (look mum lowest prices are just the beginning) & he found some sort of large water pistol in the supermarket – he could tell me the name of the water pistol & how it worked, I asked if how he knew so much about it & he explained it was on michael bubles show! God bless mr 4 he also thinks every drink in a can is a beer. When we walked past an ad for coke with the Australian cricket team he remarked that it was ‘cricket beer’! My 6 year old told me the other day that Officeworks (who’s slogan is Big ideas. Best prices.) really does have the best prices and makes getting organised for school better. I never paid attention to their slogan before or thought about it. Thanks for the heads up, I suppose our kids will keep us in the branded loop if we’re not paying attention!! yes, my kids like big W, no idea why – they must have a catchy little ditty that I’ve managed to miss. I had a witty comment to write on this blog post but between the end of the post and the comment box I’m got an ad for the 10kg washing machine of my dreams and I seriously cannot think straight anymore…. yep Ali, i’m seeing an ad for virgin, brisbane to hong kong. and the SCARY thing is that the other day i did a google search for flights to hong kong for a long overdue family holiday. coincidence?